Welcome to Exciting Bible Study! Bible study ought to be exciting! That's why we created Daily Prep and Teacher's Toolbox, to help adults have exciting Bible Study. What is Exciting Bible Study? It is Bible study that involves the learner in discovery, uses a variety of creative activities, and challenges people to apply God's truth to their own lives. Does that sound exciting to you? Then check out these resources and see if they could help the adults in your church have Exciting Bible Study. Daily Prep is a devotional guide to be used by class members each day during the week before the lesson. Teacher's Toolbox is a plan to help the teacher guide learning during the lesson, using creative Bible teaching methods. Use these materials as stand alone Sunday School lessons or small group Bible studies, or use them to supplement other curriculum materials covering the same Scripture passages for the adult Sunday School lesson or with any adult Bible study materials. When you purchase or subscribe to these materials, they are licensed for use throughout your entire church. Looking for help with your adult Sunday School lesson or small group Bible study? Try these dated materials. Each study includes both Daily Prep and Teacher's Toolbox. Daily Prep is a personal daily devotional guide to help learners prepare for the next week's lesson. Imagine if those in your class spent a few minutes each day focusing on the lesson you will teach. That kind of preparation makes the group time worth so much more. At the end of each lesson, hand out copies of the Daily Prep for the next lesson. Want to put some variety into your teaching? Teacher's Toolbox will get you into the habit of using whatever methods are needed to help your group's members learn. Study guides and work sheets, skits and choral readings, case studies and monologues, matching, fill in the blanks, puzzles, games, dramas and dramatic readings, group discussion, question and answer, charts, character studies, reaction, humor, current events, instant reports, and the list goes on and on. Use our teaching plans for awhile and you'll find yourself coming up with creative teaching ideas of your own. Look on the "Subscribe" page for information on how you can receive a free trial subscription. Ideas I never thought of. Daily Prep and Teacher's Toolbox have become an essential part of our Sunday School curriculum. Our 154 plus teachers find them to be an invaluable tool for their preparation on Sunday mornings. I wouldn't want to teach without it. 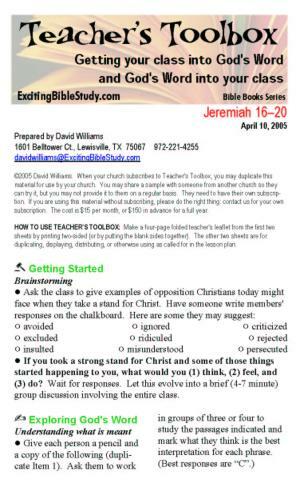 As minister of education at Tallowood Baptist Church, Houston, I led our staff to subscribe to the teaching helps for our adult teachers for more than a dozen years. They were choice and very popular among our Sunday School leadership in weekly preparation. Every week David's materials were fresh, on target with lesson topics, and easily applicable for teachers and learners. I heartily recommend these materials for exploring and teaching the Word of God. Tallowood continues to use the materials on a regular basis. Our teachers love the Toolbox. This makes Bible study exciting! Daily Prep is a good reminder of the upcoming lesson as well as a useful tool for encouraging a daily study time. I have enjoyed using the Teacher's Toolbox for years. It is a valuable resource. Many of the useful ideas in lesson presentation are ways to allow learners to discover for themselves the truths in God's Word. Daily Prep has gotten me into the Word. We canceled our subscription once. The next month my teachers revolted, demanding, "Where is my Toolbox?" Needless to say, we immediately reinstated our subscription. I thoroughly enjoy the fresh approach to lessons in the Toolbox. The creative ideas engage the student in the learning activities as they discover truths from Scripture. Thank you for sharing your creativity with those of us who are not gifted in that way. My class is smiling now.